In a current news story it was reported that a Georgia House panel approved a bill that would toughen penalties for operating an unlicensed personal care home, raising a first offense from a misdemeanor to a felony. Unlicensed personal care homes have been a problem in Georgia for years, but two recent cases of abuse prompted the House Health and Human Services Committee to action. Unfortunately, cases of abuse and neglect are far too common in many parts of the country. Without real-time visibility to patient point-of-care with a home care system or home care software program like ClearCare Online, senior care homes and other facilities lack proper supervision and accountability. The bill for changing the penalty from a misdemeanor to a felony passed unanimously and now heads to the House floor. Although this change is a great first step in reducing elder abuse, unfortunately it will not eradicate it completely. Adult care homes are notoriously understaffed. Employees may also be inexperienced or unqualified. But what is the alternative? Many families enjoy the security and reliability of working with a reputable home care agency that offers a home care system or home care software such as ClearCare Online. Unlike adult care homes or other long-term care facilities where personalized care from an attentive provider is the exception, not the rule, in-home caregivers are focused on each individual patient. With a home care system or home care software program, caregivers clock into their shift using the client’s home telephone. All daily tasks must be updated before the caregiver can clock out. Remote family members can log into ClearCare Online’s web-based home care system and verify that their loved one has taken his medications or made it to his scheduled doctor appointment. 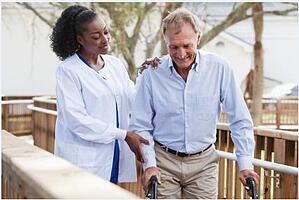 The type of peace of mind that comes with home care software is unparalleled. Experts estimate more than 80 percent of elder abuse cases go unreported. Could your elderly relatives be suffering silently? Take action now and utilize ClearCare Online’s home care system and home care software to ensure the very best for your loved ones.